Ikebana has existed as a uniquely Japanese art form for approximately 600 years. 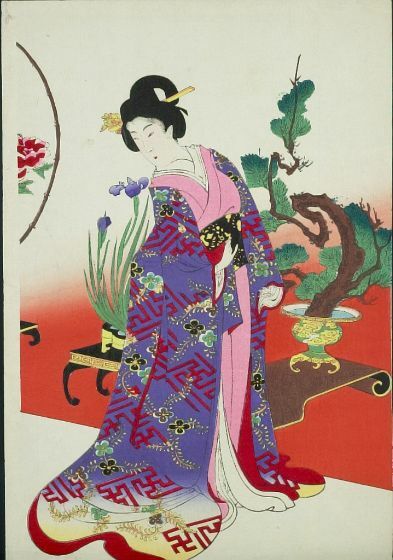 The earliest known text, Sendensho, is a compilation of Ikebana forms and practices covering the years from 1443 to 1536. For someone from a culture as new as the United States, this kind of timeline is mind-boggling. We’re talking about the age when Marco Polo was discovering the Indies, and DaVinci was painting the “Mona Lisa”. 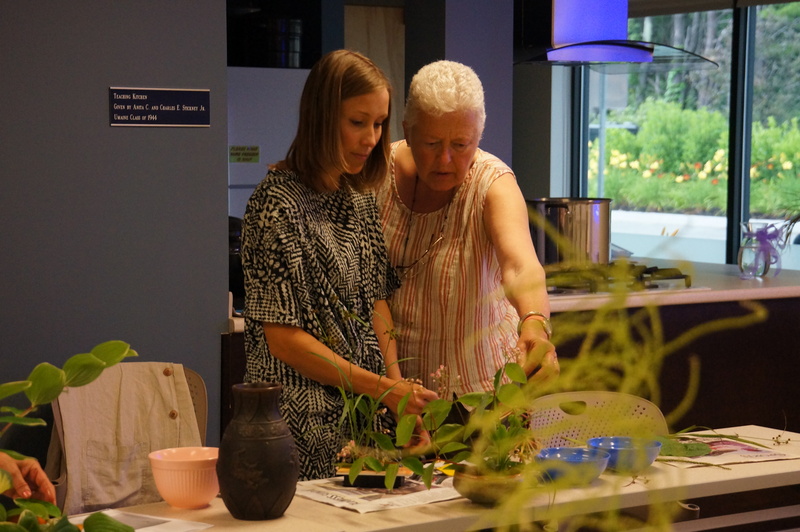 Ikebana’s rich history evolved from the Buddhist practice of placing ritual flowers at the altar, to it’s present-day status as an internationally practiced art-form. Rooted in awareness kin to reverence of the seasonal beauty of trees and flowers, and informed by a Japanese sense of hospitality, simplicity and delicacy, it is an art altogether separate from western concepts of flower arrangement. 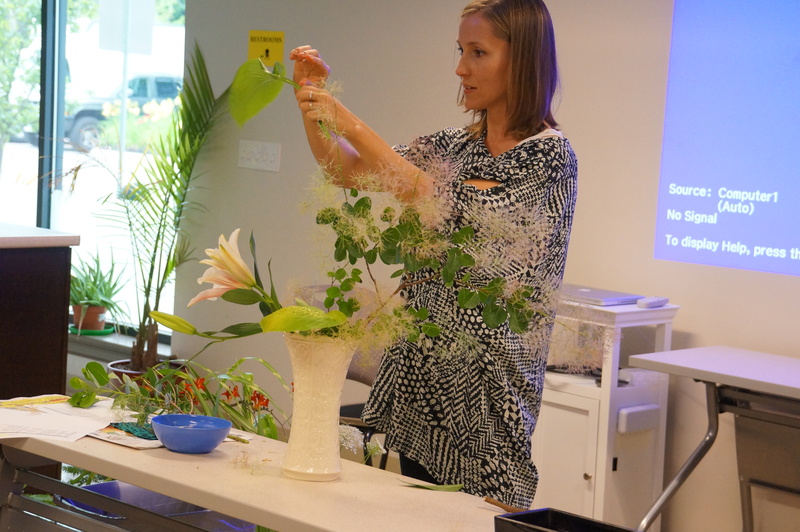 Whereas western flower arrangement creates beauty by addition, Ikebana is all about the beauty of subtraction. Less is more, and knowing what to cut and what to leave is a skill developed over years of practice. Speaking of practice, as I mentioned in my post about calligraphy, the nature of Japanese practice is quite unique in the world. We are not talking about a few months or years spent enjoying Ikebana as a pass-time, nope, what is truly required if one is to become a master in the Japanese sense, is a life-time of dedicated practice. 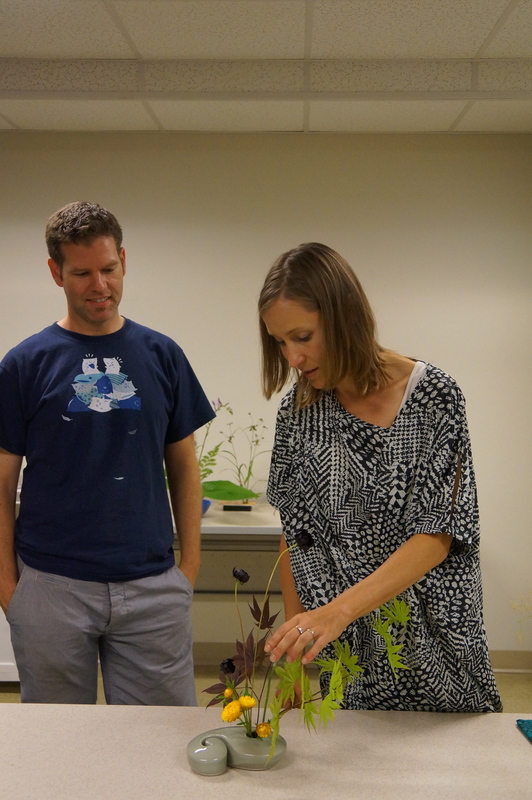 When I first encountered Ikebana, I had no knowledge of the art and no previous experience with flowers. What attracted me was perhaps beginner’s blindness: by following the simple instructions and patterns, it seemed easy to create something beautiful. 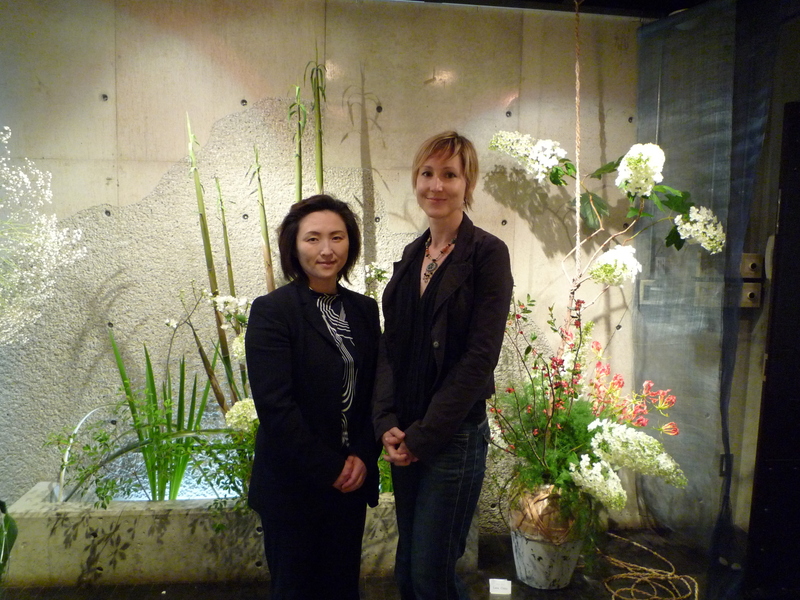 With Nagai sensei at my first Ikebana exhibit in 2009. My composition (on the right) used white hydrangea from my garden, and branches from a neighbor. Seven years on I’ve realized it’s not that simple. With knowledge comes discernment, and with discernment comes responsibility. Yet, as my sensei often reminds me, having recently received my “shihan”- the first level of qualification as a teacher, I am but at the start line. The novice’s initiation is over, and now I must push past mere enjoyment and commit to the practice if I am to achieve excellence, and I must learn to become part of the organization and follow the rules. Which brings me to a sensitive topic- I have to admit that Japan’s infamous hierarchical social structures grate hard on my western sensibilities. Although I deeply value the immense reservoir of knowledge, skills and wisdom that are preserved and promoted through the maintenance of the traditional arts in Japan, the weight of tradition can have a crushing effect on individual initiative and freedom of expression. It requires finesse to dance the line between individual expression and tradition or group culture. And it certainly requires finesse to navigate the murky waters of Japanese organizational politics. Only time will tell whether I succeed or fail in this endeavor! Another perplexing pattern in the world of Ikebana (and in many of the other traditional Japanese arts for that matter) is that although it seems to be a waning art-form in Japan, it has numerous and prominent champions abroad. Those who can take the skills and inspiration from the art whilst remaining unfettered by old patterns of organization are pushing the limits of Ikebana to new and exciting heights. And whereas in Japan the traditional arts are often stigmatized by the younger generations as being the domain of grandmothers, in the West, experimentation with these very same traditions can provide contemporary artists with a cutting edge. Demonstrating nageire (standing vase) techniques at a workshop in Maine in 2012. This brings us to the heart of the matter which is to question what is the inherent value in today’s modern global society of this particular practice/ philosophy/ art? In my own practice of Ikebana, I find inspiration in working with the elements of nature- developing an awareness of the innate qualities of different materials, the seasons and cycles of life and death. Living an urban lifestyle, this opportunity for connecting with nature, no matter how seemingly trifle, provides a sense of well-being and nourishment. Furthermore, as a creative type who came to Ikebana from the world of painting and ceramics, I love the accessibility of Ikebana- all that’s needed is a pair of scissors and some plants. And if you have your own garden, everything you need is already right at your fingertips. True to the philosophy of “Ikebana, by anyone, using any materials, anywhere”- the motto of the school of Ikebana I am studying in. And last but not least, there is that secret glow, the sense of accomplishment and pride at having created something with your own hands, even something as simple as an arrangement for a nook and cranny of your home. Carving out a space and time for beauty, a space for creativity, for expression. 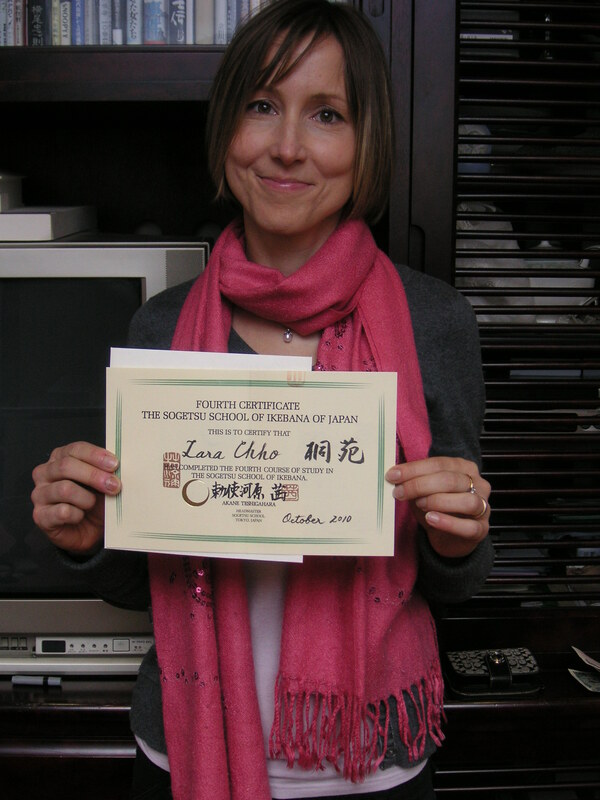 This entry was posted in Ikebana, Japanese arts, Role of the arts in society and tagged becoming professional ikebana artist, cultural exchange, Exhibitions, Ikebana, inspiration, Japanese artists, japanese arts, japanese folk arts, japanese spirituality, learning ikebana, nihonbi, studying traditional arts in japan, traditional japanese arts. Bookmark the permalink. Light and dark, airy and full, the combination of air and light, beauty in space and emptiness. The Sensei of Flowers is You …when they fall in your hands. Well put Lara! Beauty – a day at a time. It may be a strange concept as people rarely believe plants to be creatures of nature, and yet they too have a spirit. A plant spirit that nourishes itself with light and water and needs the loving care of a Gardener. Sounds like someone I know. Once you know the notes, you can sing any tune. Once you know the steps, you can dance any dance. Flowers, once you know their size, shapes and colors, they grow with you an blossom. They grow and blossom with you as their keeper.